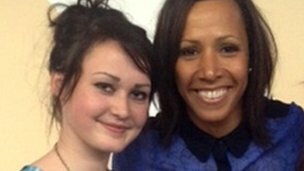 An Armagh teenager who has been in care most of her life is one of 20 children to complete a UK-wide mentoring scheme headed by Dame Kelly Holmes. Despite her difficult background, Christina Lester has become head girl of City of Armagh High School. The teenager has made a video which aims to challenge negative perceptions of foster care children. “I’ve gained a lot of confidence through this programme and I’m just a happier person,” she said. “Now I actually think that I can do a lot more things with my life and I realise that you just have to work for it. The six-month programme, organised by education charity AQA and the Dame Kelly Holmes Legacy Trust, selects 20 teenagers who have encountered challenging personal circumstances and pairs them with athlete mentors. With their mentor’s help, they work on social action project in their local community to boost their confidence and personal skills. Christina was mentored on the programme by former England hockey player Charlotte Hartley.